Relative to contact sports, like football or rugby, baseball appears to be safe. However, the extreme motions involved in pitching and swinging put baseball players at risk of injury. In young players, poor mechanics often contribute to back strains and injuries. In susceptible individuals, playing baseball can cause pain related to spondylolysis -- a defect in the connection between vertebrae that affects 3 to 7 percent of the population, according to Cleveland Clinic. The low-back pain of spondylolysis is generally diagnosed during the years of teenage growth spurts and intensifies with vigorous activity. Back pain is a frequent complaint of baseball players. 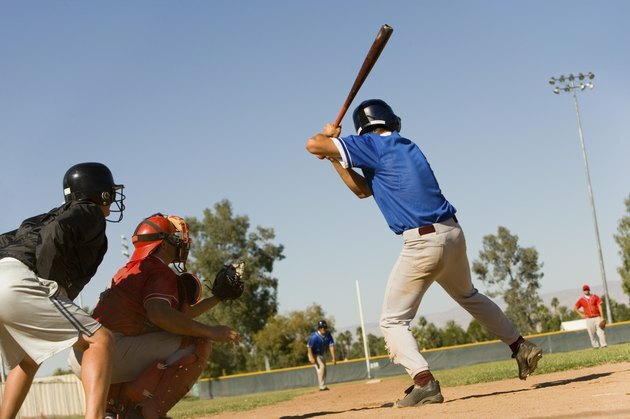 A baseball swing causes the back to twist at high speed, possibly leading to muscle strains and spasms. Tendons that connect back muscles to the skeleton can tear when pulled too hard. Poor conditioning or body mechanics increase the odds of a painful back injury. If you strain or injure your muscles, resulting in back pain, contact your medical provider. Rest is often recommended as a first step toward relieving back pain, as inflamed and sensitive muscles need time to repair themselves. An ice pack or cold compress may ease some of the swelling and discomfort. For mild to moderate pain, your doctor may recommend over-the-counter medications. Generally, after a few days of rest, you can slowly increase your activity level. A physical therapist can instruct you in specific exercises to speed injury recovery and help prevent recurrence. Call your doctor if pain suddenly intensifies or you lose feeling in one of your legs. Each vertebra of the spinal column is joined to another by a thin piece of bone between the segments, an area called the pars interarticularis. With spondylolysis, a weakness in this area can lead to fractures and accompanying low-back pain. Although spondylolysis is a more common injury in contact sports, both pitching a baseball and swinging a baseball bat can exert high levels of twisting force on the lower back, resulting in stress fractures to this region. In most cases, doctors can treat spondylolysis with physical therapy and anti-inflammatory medications. Rest will ease initial discomfort, after which rehabilitation strengthens the muscles surrounding the damaged vertebra. Complications from the condition are not typical, and complete recovery is normal. If the vertebra slides forward and out of position, however, a more serious problem known as spondylolisthesis may develop. In a worse case scenario, spinal fusion surgery is necessary to correct excess slippage of the vertebrae.